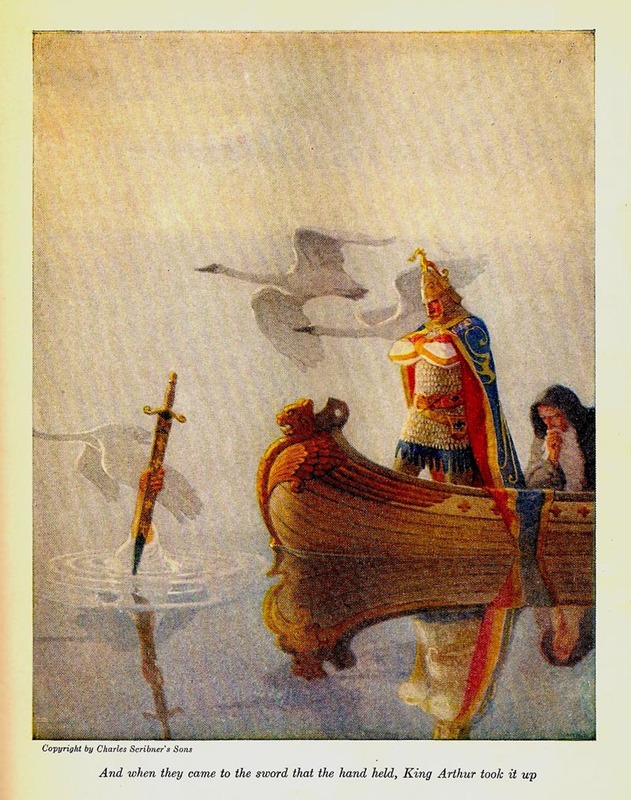 The next scan, and in pretty much the order of the nine illustrations included in the book, an amazing scene of King Arthur standing in an elaborately carved small boat contemplating the strange sword in the lake. And... to add to the eery scene... the three swans flying, apparently noiselessly through a misty background. Next, 'I am Sir Lancelot du Lake, King Ban's son of Benwick, and Knight of the Round Table'. 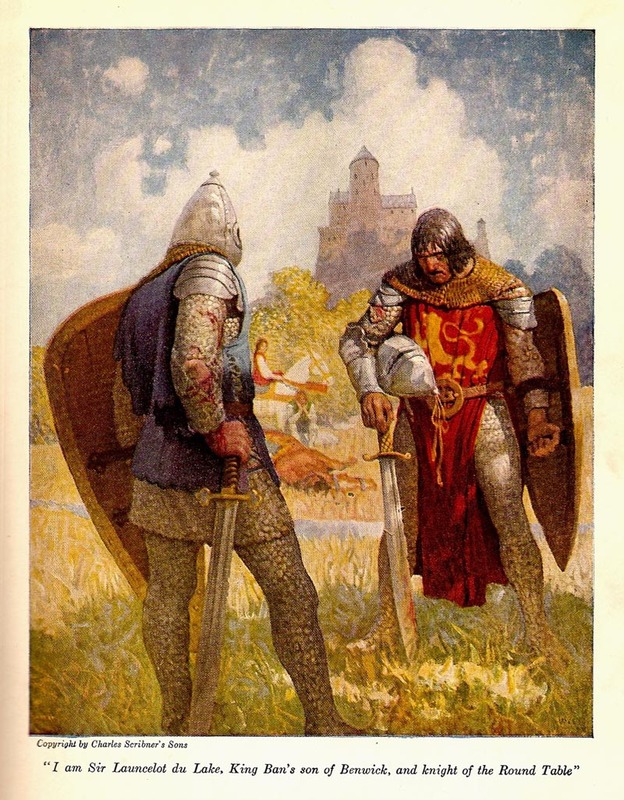 Typical of Wyeth's ability to dramatize a scene of the two knights meeting. I won't comment on all the following illustrations except to say Wyeth never let the reader down. Each is a marvel of composition, draftsmanship and drama... and each offers the readers renewed interest and a glimpse of the times and mood of the story. * Tomorrow, more scans from "The Boys King Arthur", courtesy of Charlie Allen. * If you are new to Today's Inspiration and never read Charlie Allen's blog, this is your chance to get to know our guest author better. Drop by there and peruse Charlie's archives for some great stories and some truly amazing artwork! Charlie, a real treat to see N.C. Wyeth's illustrations that are rarely reproduced as examples of his work. I fully agree he had it all. I've seen some of his originals.. quite bold and painterly, and when they are reduced to reproduction size, the detail and reality is amazing, as shown in your scans. His character studies are unequalled. It's as though he was there, painting them from life. He was quoted as saying that if you show two men fighting, you had to feel the strain in your own muscles while painting it. N.C. Wyeth and Harvey Dunn were the two illustrators from Howard Pyle's school that had the most influence on future illustration. They were both powerful men that did powerful illustrations. I love Wyeth's and think each member of the family had a unique touch. I'm somewhat embarrassed by my audacity to make criticism but the last image of the man captioned as eating fruits and whatever could be found has a tangent that bothers me. The tree root over his head is the one compositional thing I would have changed. Joel; I'm glad you said it - it was bothering me too! Sorry to be a bit audacious as weöö; but to me this criticism has something of bean-counting. There's so much here to atone for some miscarried roots and carrots. And the background of this very last image with those ancient trees and the brook looks most refreshing. After reading Joel and Leif's remarks, I took another look at the illustration in question. As part of the overall design, I have no problem with the tree roots directly behind the guys body and head. It's basically an organic design feature that flows from the tree down to the point of interest. N.C. Wyeth was known for his unique and sometimes unorthodox approach to his compositions. He could have chosen a more traditional approach to handling the roots, but I think it adds to the sense of being deep in the forest, and blending with nature. Esthetically the man becomes part of the virgin terrain, instead of an imposing figure with the forest as simply a background. 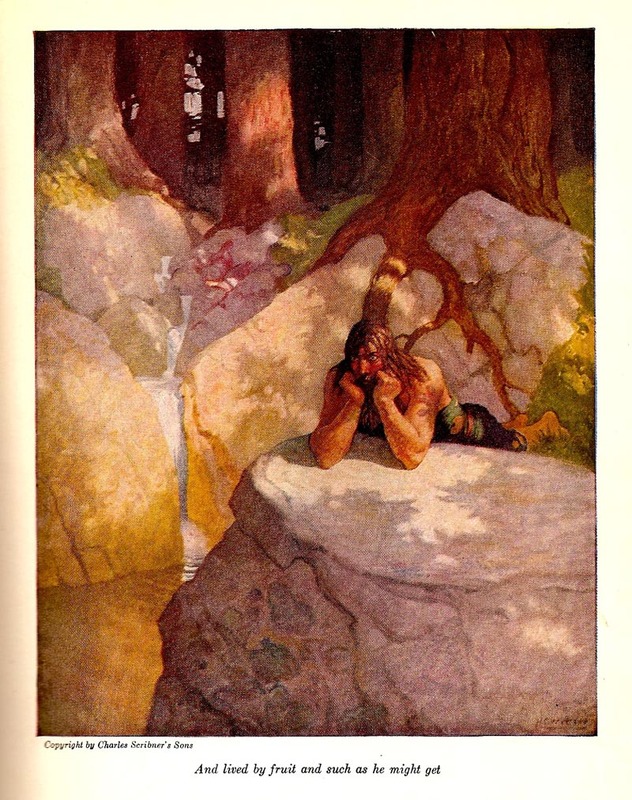 It may not be the most exciting N.C. Wyeth illustration, but it conveys the right message for that scene, in my opinion. Nope... sorry, I still find it odd looking and I noticed it right away. It stood out from all the other pieces which feature impeccable picture design. Tom, Wyeth may have been known for his sometimes audacious experimentation (and kudos to him for that)... but this experiment fails. The fellow looks comical... like he's wearing a tree root hat!